Lacing activities help children develop fine motor skills, bilateral coordination, motor planning and visual perceptual skills. In addition, lacing helps children practice the precursor skills for shoe tying and sewing. 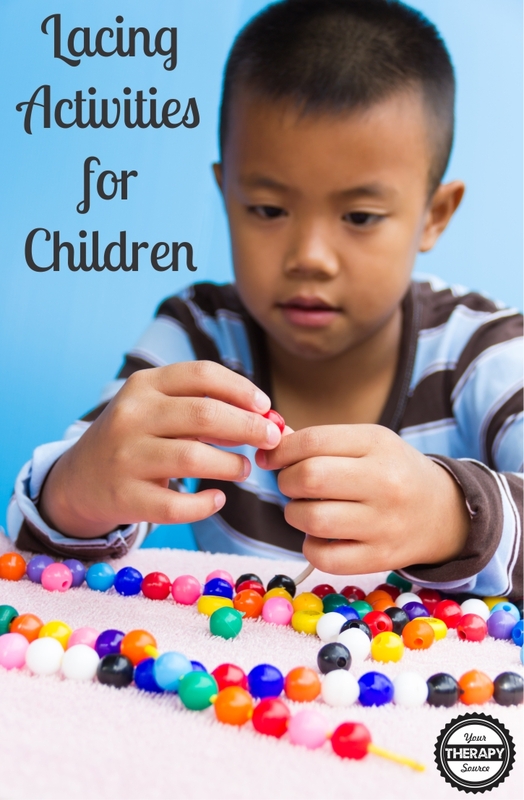 You can start simple and have children practice lacing large beads progressing to smaller beads on a thread. If you want to make it easier, start by lacing large beads onto a pipe cleaner (the stiffness of the pipe cleaner makes lacing the bead easier). 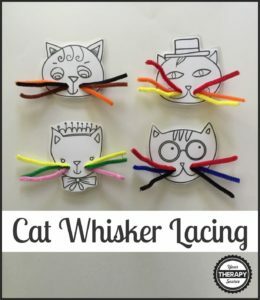 Cat’s Whiskers Lacing and Busy Bag – Just print out the free download, cut out the kitty’s, laminate and hole punch to indicate where to lace the pipe cleaners. Toss some pipe cleaners cut in half inside the busy bag and it is all set to go. The child can lace the pipe cleaners through the holes to give the cat’s their whiskers. 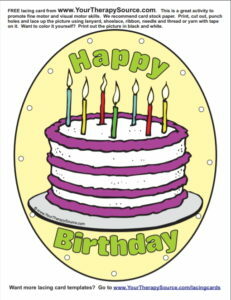 Happy Birthday Lacing Card – Practice fine motor and visual skills with this birthday lacing card. Make on a child’s birthday or for a gift for the child’s parent or teacher. Print, cut, punch holes and lace it up for a cute present. 3-D Lacing – Add some dimension to a lacing activity. You will need a piece of cardboard (I purchased left over mat board pieces at the craft store for dirt cheap), hole punch, pipe cleaners and an assortment of beads (or use pasta). The adult needs to punch the holes around the edges of the cardboard. It sure is a hand work out! 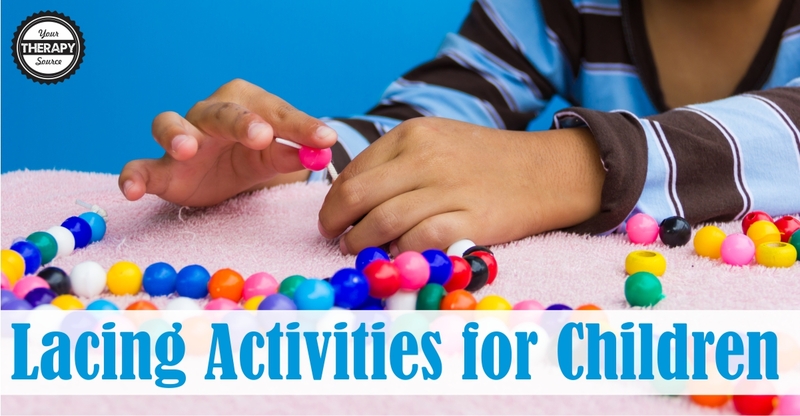 Provide the child with the pipe cleaners, beads, and the lacing board. This is a free form artwork so let the child create as he/she wishes. Simply lace the pipe cleaner through a hole, add a bead or two and put the pipe cleaner back through another hole. 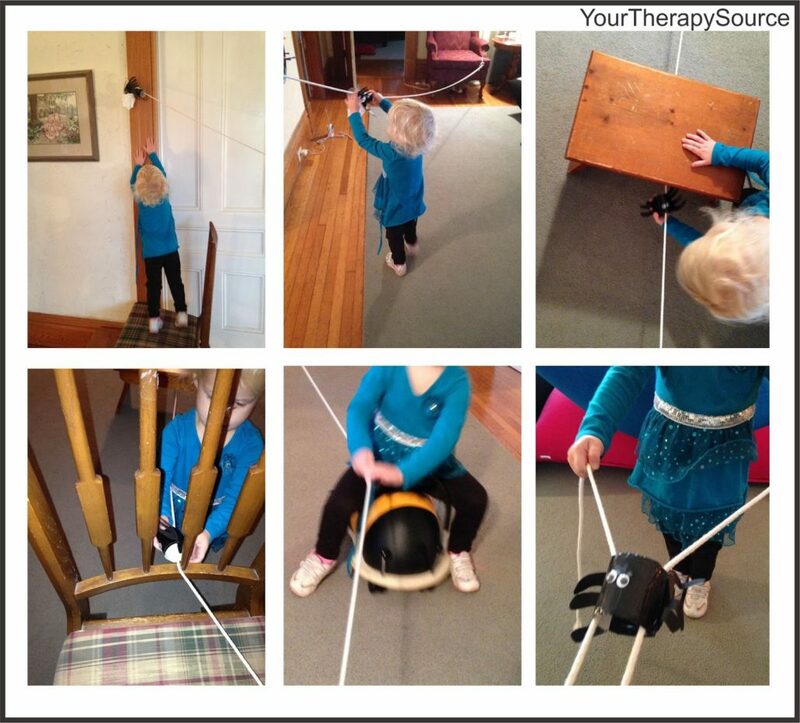 Lacing Recycled Cardboard Tubes Throughout an Obstacle Course – Here is a Fall or Halloween activity to encourage eye hand coordination, bilateral coordination, motor planning and gross motor skills in children. We used spiders and ghosts but you could just use colored recycled cardboard tubes for other times throughout the year. Create, Hide and Lace – Watch the video where the children practice scissor skills, bilateral coordination, physical activity, and lacing skills.